4.30PM: IT WAS a massive retail fire, the likes of which Coffs Harbour has not seen in years. It took 40 firefighters on five hose lines almost six hours to extinguish the Rivers Super Store in Harbour Dr - a fire that saw the Coffs Harbour city centre in lockdown. One firefighter and several store staff were taken to hospital with smoke inhalation. A total of 12 people were treated by ambulance paramedics. As police briefed the media on the arrest of a 48-year-old man in relation to the blaze, the city centre was reopened to traffic just after 4pm. The man is assisting police with their inquiries ahead of forensic examination of the scene on Thursday. "The man was spoken to by officers on the Pacific Hwy around 12.30pm and was brought to the station where he is assisting us now with our enquiries," Acting Coffs Harbour Crime Manager Senior Sergeant Peter O'Reilly said. "We can't say that the fire is suspicious at this stage until our experts get in there and analyse the crime scene, the cause and the origin." What started as a small blaze fought by staff with fire extinguishers inside the store around 9.30am quickly developed into a major fire. As NSW Fire and Rescue reached the scene adjacent shops began to be threatened and the Coffs Harbour city centre around Harbour Dr was quickly evacuated. The Commonwealth Bank branch next door to the store sustained major smoke damage, as did offices above the buildings. "It was an extremely difficult fire to fight due to the heavy smoke and the fuel load inside the store," NSW Fire and Rescue Northern Region Superintendent David Gray said. "The clothing and boxes of clothing certainly fuelled the flames. "Crews with breathing apparatus fought the fire from the inside of the building and the difficulty was so great that it took several hours for firefighters to get to the seat of the fire. "Heavy thick smoke emanating throughout the store made sure the visibility in there was literally zero. "Our responding crews from Coffs Harbour, Sawtell, Bellingen, Dorrigo, Nambucca Heads and Hazmat Grafton did an absolutely superb job. "Each firefighter went through four or five breathing apparatus tanks which shows how much time was spent attacking this fire from the inside. 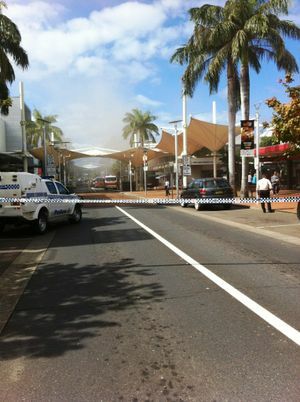 As smoke billowed across Coffs Harbour much of the city centre mall was cordoned off and evacuated by police. Many retailers in the heart of Coffs Harbour recorded considerable losses in their daily takings. 3.30PM: POLICE have arrested a man in relation to to the fire which saw the Coffs Harbour city centre come to a standstill today. At about 12.30pm, a 48-year-old Coffs Harbour man was spoken to on the Pacific Highway. He has been arrested and taken to Coffs Harbour Police Station where he is assisting investigators with inquiries. Police are expected soon to be conducting a media conference on the matter. A total of 12 people, including a firefighter have been treated by ambulance paramedics for smoke inhalation with four taken to hospital for further treatment. 11.30AM: ONE person has been hospitalised with smoke inhalation and another eight people treated by ambulance paramedics at the scene of the Coffs Harbour Rivers store fire. Police are advising motorists of road closures in the Coffs Harbour city centre. Police and Fire & Rescue NSW crews were called to the shopping centre at 9.40am. The fire spread to the Commonwealth Bank branch and the shopping centre was evacuated with all staff accounted for outside the building, police said. Harbour Dr has been closed between the Pacific Hwy and Gordon St as well as The Mall and Park Ln while emergency services remain on scene and attempt to extinguish the fire. Members of the public are being urged to avoid the area due to a large amount of smoke still in the area. Detectives from Coffs/Clarence Local Area Command are investigating the circumstances surrounding the fire. 10.30AM: FIREFIGHTERS continue to work to bring the Rivers store fire under control in Coffs Harbour. Heavy smoke continues to billow from the building. Police have cordoned off the Harbour Dr mall and evacuated store staff and shoppers from the city centre. Staff members of the clothing store have been treated for smoke inhalation. 10.10AM: IN a matter of minutes the City Centre has become a ghost town. Emergency service crew members have been asking people to leave the area. 10.00AM: A HAZARDOUS materials vehicle has arrived at the scene of a fire in the Rivers store in Coffs Harbour CBD where the smoke coming from the blaze is giving off a putrid smell. The area on the south side of the city centre has been roped off from the newsagency to the the city square. Nearby stores, including the Commonwealth Bank have been evacuated. A witness at the scene reported the fire started in the eaves of the store and what begun as a puff of white smoke became a full blaze in the space of only 10 minutes. Three people were evacuated from the store which is believed to have come under new management only in recent months. 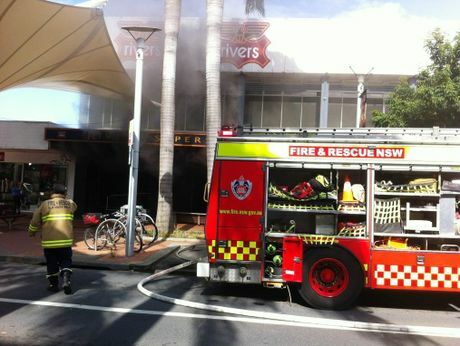 9.50AM: Emergency services have raced to Coffs Harbour's city centre after a fire started in the Rivers store. More news at it comes to hand.